The laying of white lilies in front of the Iranian embassy by Amnesty International is one of many protests planned to take place outside Iranian embassies worldwide. 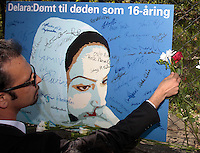 Iranian authorities executed Delara Darabi in Rasht Central Prison on Friday morning May 1st 2009. She is the second person to be executed this year after being convicted of a crime she was alleged to have commited while still under 18, Amnesty International has revealed. "Amnesty International is outraged at the execution of Delara Darabi, and particularly at the news that her lawyer was not informed about the execution, despite the legal requirement that he should receive 48 hours' notice," said Hassiba Hadj Sahraoui, Deputy Director of the Middle East and North Africa Programme. "This indicates that even decisions by the Head of the Judiciary carry no weight and are disregarded in the provinces," said Hassiba Hadj Sahraoui. Delara Darabi was convicted of murdering a relative in 2003 when she was 17. She initially confessed to the murder, believing she could save her boyfriend from the gallows, but later retracted her confession. She was detained at Rasht Prison in northern Iran since her arrest in 2003, during which time she developed a significant talent as a painter.